What an exciting month this is turning out to be and it just started! As I’m writing this newsletter, Ginger and I are planning some upcoming events Ginger Scraps will be having! I’ll have a lot more information for you next week, but trust me when I say these will be great with some amazing prizes! Did you happen to hear our news we had on Wednesday? Which news are you thinking? 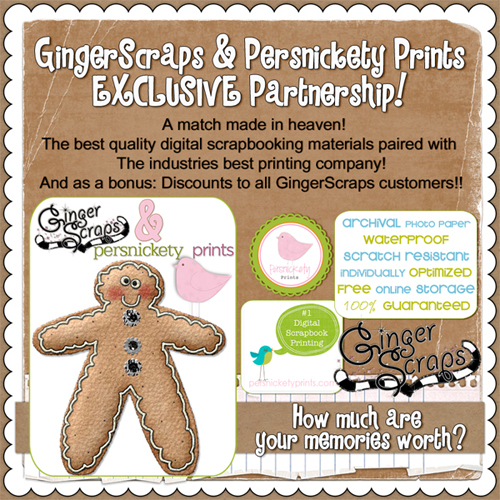 Well, I’m talking about our EXCLUSIVE partnership with Persnickety Prints! Our customers will receive 10% off anything at Persnickety Prints just buy entering our coupon code (which you can find in the store). There is no catch! You place your order with Persnickety Prints, enter our coupon code, they ship your order to you, and you save 10%. Daily Download has been going on for a week now! Everyone is just loving it – are you? The links from day 1 through today are still up, so you have plenty of time to grab them now. Don’t wait though because it won’t last too much longer! So let’s talk about our new releases for this week! Don’t forget our monthly collab deal! Spend $10 in our store and get our new GingerBread Lady Collab for only $1! That is a $6 savings!! Plus with everything being 25% off, think about everything you can get! Have you gone on a road trip this summer? This is the kit for you! 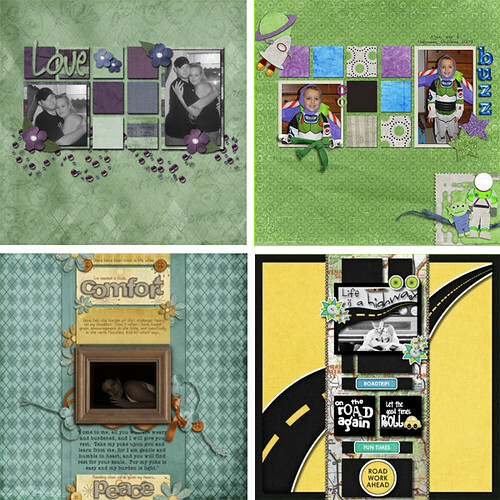 Roadtrip by Wyld Web Designs contains 12 papers and over 30 elements to highlight those special highway memories. Whether you were on your way to a camping trip, on a family vacation, or just plain ol’ boring driving somewhere, this kit can brighten up any photo layout! Now you need a catchy title for those terrific getaway layouts! This collection of wordarts will give you the perfect one! This pack contains the 7 wordarts as shown plus a bonus blank speech bubble! Some elements come in both shadowed and non-shadowed versions for your convenience. All of these are 25% off this week only, or you can get all three pieces for one low price by purchasing the Roadtrip! Value Bundle! A savings of 30% off the regular prices, this is the best deal for those highway photos! Amy of Unforgettable Moments designed “Thoughts Of You” in the evenings while vacationing in the mountains. The beautiful colors the trees cast on the hillside as the sun disappears can be very inspiring. This kit is perfect for scrapping layouts of people you love and all your beauty inspired moments. The everyday price for this kit is only $4.00, but if you go and get this kit now you can get it on sale for $3.00. 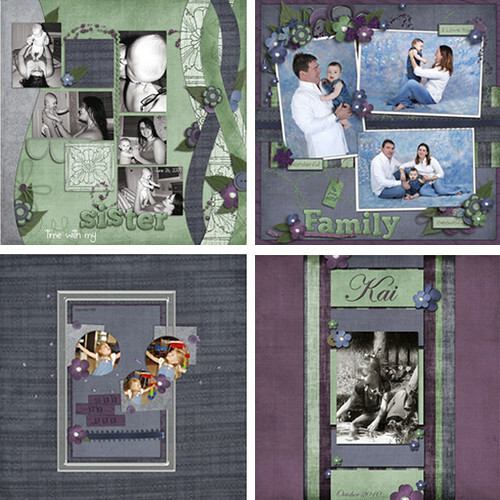 “Blocking” is a really popular scrapbook trend right now. Amy (of Unforgettable Moments) has made it fun and easy for you to create gorgeous blocked pages with The Brilliantly Blocked Template Set. Simply clip your favorite papers (may we suggest using a combination of patterned and solids) along with your photos to the blocks and make your layouts absolutely brilliant! The Brilliant Blocked Templates are a steal at the regular price of $2.50, however they are currently on sale for $1.75 and that is one deal you don’t want to miss! Want to make a super cute card the super simple way! Use this template by Creations By Julie to make this Apron Card! Just clip your papers to the layers, print fold and add ribbon. Makes a cute Baby Bib Card too 🙂 Perfect for Tea Party, Baby Shower invitations, and such a cute card for your girlfriends who love to cook. Julie used the Apron Card Template and the Awesome Good Morning Collab to make this card. I used the Apron Card Template and the Awesome Goodmorning Collab to make this card. Red, White and Blue Felt Flowers! These flowers are all handmade by Creations By Julie! Carefully extracted for your scrapping and designing pleasure! Both full color and grayscale included. Recolor the grayscale as you please, for Creative use and Personal use. This is a super fun and cute kit for the best pals you can think of. It is very versatile for both boys and girls. HK Designs really enjoyed making this kit and hopes you love it as much as we all do!! Best Pals includes 9 papers and over 40 elements! This kit is on sale for only $3!! Sweet, soft mini-kit to scrap your best cooking photos! Grab Little Pleasures by Scrapbookizate for just $1.50 and get 6 papers and 12 elements. The neutral tone of this kit is perfect to match all kind of sweet photos: birthday cakes, wedding cakes or even lovely dinners! 30 unique buttons to use in your designs. This big Button Pack by Scrapbookizate will match all types of kits because they are different! How much does this pack cost? Just $3!! Grab it and make awesome kits. Happy Friday! Don’t forget to check out our new releases! Everything is 25% off for the weekend! Here is your link for today! !